SunCafe is an exciting & healthy organic eatery just steps away from Hollywood & Universal Studios. Our converted house on Ventura Blvd offers great ambiance in the heart of the city along with several intimate private and semi-private dining options. SunCafe is a celebration of food prepared in its natural state. Our chefs start from scratch with the freshest organic ingredients to create rustic World Cuisine for the liveliest, most flavorful food you may ever taste. We offer many vegan, gluten-free and raw food options. From intimate dinners for 10-15 around our fire pit to cocktail parties on our multilevel patio, our converted house offers a host of private and semi-private dining options. We look forward to providing an unforgettable experience for you and your guests. The SunRoom, our private dining room, overlooks the patio and the dining room through a multitude of windows and French doors. The room is perfect for smaller special and private events. 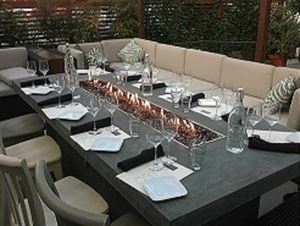 Our patio is perfect for seated dinners of up to 25 or cocktail parties for larger groups, offering an additional option as a charming semi-private space within our facility. The Fire Pit, located on the upper patio, offers a cozy atmosphere (literally) for intimate dinners of 10-18 or cocktail parties for up to 75 guests. Our Dining Room offers a warm and inviting atmosphere featuring spectacular restored hard wood floors along with unique tile work and fixtures. With many different spatial arrangements the main dining room works for both small and large events, always maintaining its cozy ambiance. The Mad Hatter, our communal table, is the centerpiece to the dining room. Twelve feet long, centered between four beams fashioned from reclaimed doors from Beverly Hills demolitions, the Mad Hatter seats up to 12 in mismatched chairs, and is a popular destination for business meetings needing WiFi and a bite to eat!